A few weeks ago, I took a trip to the newly open, Liberty Public Market here in San Diego. Located in Liberty Station Point Loma, it's filled with so many foodie options and "brings together the cuisines and culture of San Diego." I decided to stop by for the first time after work one day—since it's literally minutes away—to grab some lunch and hopefully sketch a bit. The market opens at 11am everyday and I got there a little after 12 and I was happy that it wasn't extremely packed. I had a nice healthy salad from Local Greens, an awesome salted caramel latte from West Bean Coffee Roasters, and took some macarons to go from Le Parfait Paris. I sat at a high top communal table and had a great view of the long walk way leading to half the vendors. 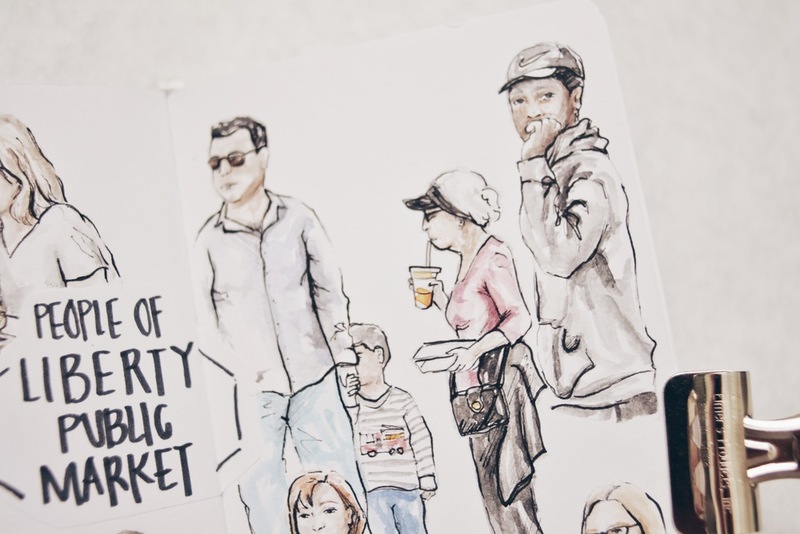 I originally thought of attempting an urban sketch in an hour of one particular scene, but I was really enjoying my salad and was engrossed in people watching. I didn't have a lot of time to urban sketch (i.e. Auntie Duties) so what I decided to do was take some quick photos of some people I wanted to sketch in my sketchbook. 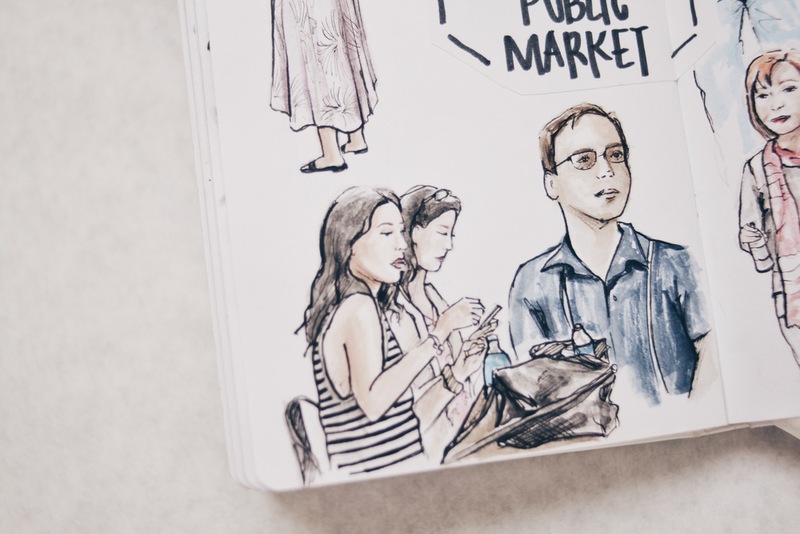 When I got home, I then thought of making a 2 page spread called, "People of Liberty Public Market" and arrange the people randomly on the pages. I didn't take enough photos that days, so I decided to go again a couple days later with my friend to snap more photos of people to add to my spread. It took me longer than I expected due to exhaustion from my job and video editing, but here it is! I did attempt to sketch the people in motion, but I easily got frustrated with myself whenever they'd move faster than I can get it down on pencil to paper. It's definitely something that will take a lot of practice. I've even tried to memorize poses and what the people looked like, but unfortunately, my attention span is quite short, lol. I hope to get better at it!